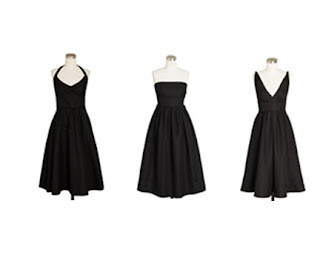 One of these dresses is the official bridesmaid dress -- which one is it? You'll have to wait and find out....Now for the shoes? hmmmmm... any ideas? And a few quick shout-outs! Congratulations to Chris and Felicia (you'll "meet" them soon as they're both in our wedding) -- they welcomed their first baby, Christopher Robert into the world on Wednesday -- we saw him briefly over the weekend and he is just as sweet as can be! I'll ask the proud parents permission to post some pics first and then you can see how cute he is for yourself! And...a long-time friend, Lisa got engaged to her boyfriend Mike last week in PARIS!! How lovely and exciting! Look forward to seeing them soon to congratulate them in person!